Raja Ramanna (1926-2004) was an Indian physicist. Ramanna was born in Tumkur in Karnataka State. He studied science at Madras Christian College before moving to London, where he completed a Ph.D. in physics at King’s College. Upon his return to India in 1949, Ramanna was recruited by Homi Bhabha to join the Indian nuclear program. Ramanna twice served as director of the Bhabha Atomic Research Centre (BARC), and India tested its first atomic bomb in 1974 during his tenure. For this accomplishment, Ramanna received the Padma Vibhushan, India’s second-highest civilian honor. 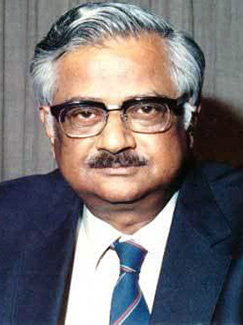 During his career, Ramanna also served as chairman of the Indian Atomic Energy Commission and as secretary of the Department of Atomic Energy. On a visit to Baghdad in 1978, Ramanna was recruited by Saddam Hussein to build an atomic bomb for Iraq. “You have done enough for your country; don't go back,” declared Hussein. “Stay here and take over our nuclear programme. I will pay you whatever you want.” Ramanna refused and left Iraq the next day. Raja Ramanna died on September 24, 2004 in Mumbai. 1926 Jul 10th Born in Tumkur in Karnataka State. 1949 Earned a Ph.D. in physics from King's College in London. 1972 to 1978 Served as director of the Bhabha Atomic Research Centre (BARC).